The Grand Tuscany Bench by Hanamint is part of the widely popular collection that features chairs and surfaces of all heights and purposes. The Bench comfortably seats two people and can be used outdoors in a variety of settings, such as in a garden, poolside, or in a patio or screened in setting. The pattern is displayed prominently on the seatback so that the bench may fit seamlessly with other pieces, or it can integrate with other furniture or stand beautifully alone. 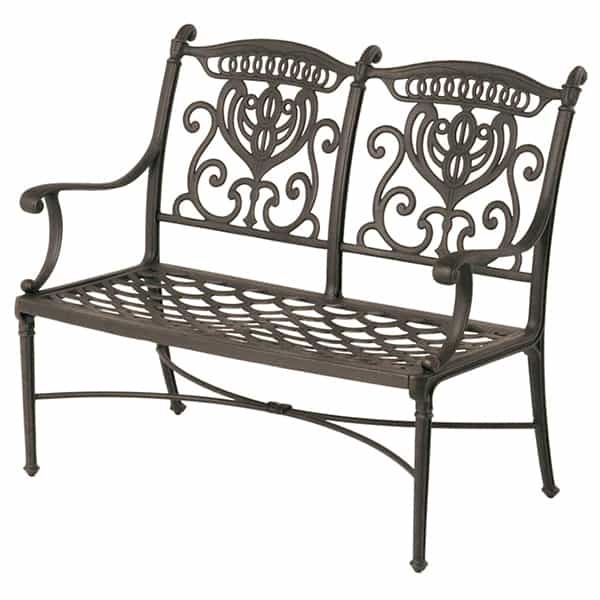 It's sturdy, made of powder coated aluminum, and features an all-weather cushion on the seat as well as the seatback, and the cushion is covered with the fabric of your choosing. If you’re expecting longevity, trust the old style casting process, and find reassurance in the Hanamint 10-year warranty.